NEW YORK -- A front group for Washington, D.C.-based public relations firm Berman & Company is back with new targets: green buildings, green groups and the Environmental Protection Agency. Berman & Co., helmed by Rick Berman (who was once called "Dr. Evil" by CBS' "60 Minutes"), has a long history of running campaigns on behalf of the food and beverage industry under the banner of the Center for Consumer Freedom. Earlier this year, CCF changed its name to the Center for Organizational Research & Education, according to documents filed with the Government of the District of Columbia and the North Carolina Secretary of State's Office, which were obtained by The Huffington Post. The group also recently launched the cleverly named Environmental Policy Alliance, or EPA for short, a group "devoted to uncovering the funding and hidden agendas behind environmental activist groups." An Environmental Policy Alliance spokesperson told HuffPost that the name change is part of a "restructuring" to "broaden the work that we're doing." The CCF will continue to exist, but alongside the "EPA" under the umbrella of the Center for Organizational Research & Education. The new Environmental Policy Alliance appears to be one of Berman's first major forays into energy and environmental policy. The new "EPA" targets the U.S. Environmental Protection Agency, which it deems "America's most powerful environmental activist." Berman's "EPA Facts" site suggests that the connection between rising greenhouse gas emissions and warming temperatures is "still unclear," despite the fact that scientists have a solid understanding of the correlation. The group also argues that there are flaws in the work of the U.N. Intergovernmental Panel on Climate Change, citing reports from two well-known climate change-denying groups, the Heartland Institute and the George C. Marshall Institute. CCF's Environmental Policy Alliance also launched a campaign called "LEED Exposed" last week, which critiques the usefulness of the U.S. Green Building Council's rating system for sustainability and efficiency of buildings. The group's "research" purports to show that "LEED-certified buildings use more energy and are more expensive" than uncertified buildings. "This latest data release only confirms what we already knew: LEED certification is little more than a fancy plaque displayed by these 'green' buildings," Berman staffer Anastasia Swearingen said in a press release announcing the launch of the campaign on Feb. 28. Swearingen also wrote an anti-LEED op-ed for Forbes in December 2013, arguing, "we're clearly not spending that money wisely." A closer look at LEED Exposed's methodology reveals a significant omission. The report concludes that, as a whole, LEED-certified buildings in Washington, D.C., use more energy than buildings without the certification. But the analysis only looks at the energy use of buildings relative to size, or what is known as energy use intensity. EUI is only one of several recognized benchmarks used by building professionals to assess a building's efficiency, and looking at it in isolation ignores the importance of building density. Thus a large, abandoned building would score well for EUI, because its energy use is quite low relative to size. "Their goal is just to confuse you," Scot Horst, the senior vice president of LEED at the U.S. Green Building Council, told HuffPost. Most Americans are unfamiliar with terms like energy use intensity, he explained, and may not fully grasp the complexities of assessing efficiency. EUI is "only a very partial snapshot of what's happening," according to Horst, and ignoring other measurements "leads to very unfair comparisons." Groups like the American Chemistry Council and the U.S. Chamber of Commerce, which represent the wood, plastics and vinyl industries, have bashed LEED in the past. Swearingen told HuffPost that the alliance doesn't solely represent business interests, arguing that all Americans have a vested interest in affordable energy. "Berman makes his money as a corporate hired gun, setting up front groups to denigrate public interest organizations that threaten his clients' bottom lines," Melanie Sloan, executive director for the nonprofit watchdog Citizens for Responsibility and Ethics in Washington told HuffPost. "I'm not surprised he's attacking groups and agencies focused on the environment, given the deep pockets of those interested in paying to stop climate change legislation and regulation." "These methods of attack rely on the way people read media," Horst added. "They rely on creating confusion." Manufacturing doubt around scientific issues and sowing confusion through the media is a well-documented industry strategy -- one that Berman has often employed. Berman & Co. has previously attacked organizations like the Humane Society of the United States and Mothers Against Drunk Driving, and campaigned against minimum-wage increases and unionization. 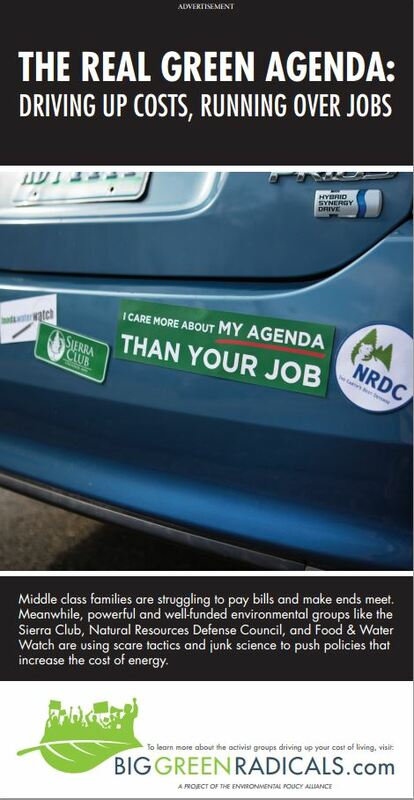 The Environmental Policy Alliance also ran a full-page ad in Thursday's Wall Street Journal, claiming that the Sierra Club, the Natural Resources Defense Council and Food & Water Watch "are using scare tactics and junk science to push policies that increase the cost of energy." "This feeble attempt at a smear campaign is a good reminder to always consider the source," an NRDC spokesperson told HuffPost. "As opposed to this newly re-named front group, we've been around for decades. We cite our research. We sign our names on our materials. And we don't lurk in the shadows because there's no reason to hide our good work to protect our air, our water and our communities." UPDATE: March 12 -- On March 9, Swearingen, writing as a "senior research analyst" for the Environmental Policy Alliance, published an online op-ed on USA Today's website. In the essay she argues "LEED certification is more or less useless as a metric for determining how 'green' a building is," and goes on to describe the LEED standard as "greenwashing." When asked by HuffPost about the column (which did not run in USA Today's print edition), a member of USA Today's editorial board said he wasn't aware at the time it was published that it had originated with Berman's group. "I thought I was up to date on their various incarnations," he said, adding that USA Today intends to add an editor's note to Swearingen's piece to clarify its origin. Berman's Environmental Policy Alliance also ran a full-page advertisement for its "EPA Facts" website in Wednesday's Wall Street Journal. The ad charges that energy prices may "skyrocket," and lambastes "oppressive energy regulations" from the Obama administration's Environmental Protection Agency. A 2013 Office of Management and Budget report estimated that the benefits of 32 EPA rules, including reduced exposure to particulate matter and other air pollution, greatly exceeded the aggregate costs of their implementation over the preceding decade.